Repair the seat while checking the seating position. 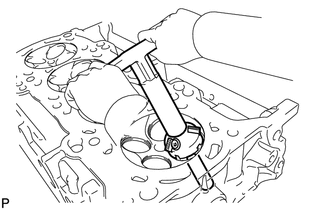 Take off the cutter gradually to make the intake valve seat smooth. 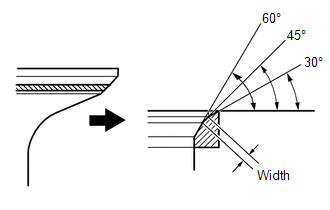 (a) Using a 45° cutter, resurface the valve seat so that the valve seat width is more than the specification. 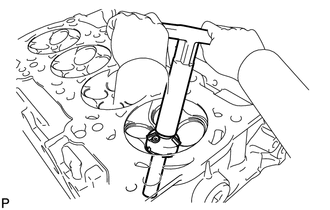 (b) Using 30° and 60° cutters, correct the valve seat so that the valve contacts the entire circumference of the seat. The contact should be in the center of the valve seat, and the valve seat width should be maintained within the specified range around the entire circumference of the seat. Take off the cutter gradually to make the exhaust valve seat smooth. 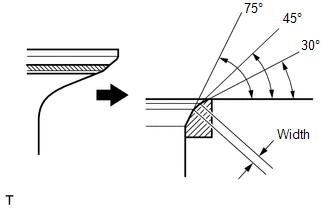 (b) Using 30° and 75° cutters, correct the valve seat so that the valve contacts the entire circumference of the seat. The contact should be in the center of the valve seat, and the valve seat width should be maintained within the specified range around the entire circumference of the seat.